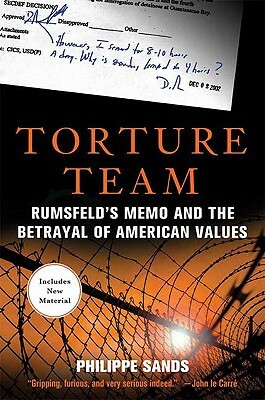 In 2002 Donald Rumsfeld signed a memo that authorized the controversial interrogation practices that later migrated to Guantanamo, Afghanistan, Abu Ghraib, and elsewhere. From a behind-the-scenes vantage point, Phillipe Sands investigates how this memo set the stage for a divergence from the Geneva Convention and the Torture Convention and holds the individual gatekeepers in the Bush administration accountable for their failure to safeguard international law. Cited in Congressional hearings, Torture Team is the "rigorous, honest, devastating" (Vanessa Redgrave) account of high ranking members of the Bush administration's involvement in authorizing torture and subsequent attempt to cover their tracks. Philippe Sands is an international lawyer and a professor of law at University College London. He is the author of Lawless World and is frequently a commentator on news and current affairs programs including CNN, MSNBC, and BBC World Service. He has been involved in many leading international cases, including those involving the treatment of British detainees at Guantanamo Bay. He lives in London, England. "Sands has written a page-turning investigation into one of the darkest mysteries in American history: how a country that has led the world on human rights came to embrace a policy of barbaric abuse. One by one, he corners the suspects and sifts the clues, shedding new light at each step along the way." -- Jane Mayer, staff writer, The New Yorker Magazine "Philippe Sands has uncovered the proper assignment of responsibility for torture and cruel and unusual punishment administered by the U.S. in the so-called Global War on Terror. Read this book to learn who made these decisions. More importantly, read it to learn how under George W. Bush and Richard B. Cheney America abandoned its strongest pillar of power--its own integrity." --Colonel Lawrence Wilkerson, former Chief of Staff to Secretary of State Colin Powell "A remorseless, shocking, forensic narrative, Torture Team leads us from Rumsfeld's office in the Pentagon, via a score of eager-to-please lawyers and bureaucrats, and shows us the brutal consequences for one detainee. The parallel with Nazi Germany's descent into immorality is impossible to escape. This may well be the most important book to emerge since 9/11."